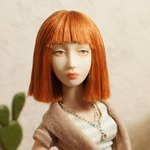 More experiment,more succesful.Now I realised how difficult make a perfect Bjd doll. Domstudio I like your spirit! A couple times I have had to redo a piece, but I feel no discouragement because I enjoy sculpting and I know that the next time I can make the piece even better! And I agree with others, she is really pretty! Even if I imagine her with the most warped, flawed body imaginable I am still impressed. Because you have clearly learned already how to cast and fire porcelain, how to sand and refine your pieces, how to use China paint, how to string that doll...many skills! Aww, even if she's not technically perfect, she's still so beautiful! Please don't hate her, she will be sad. I hope your next one turns out better, and look forward to seeing her!